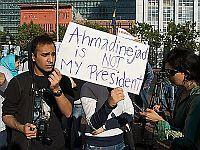 Genuine Protests or US Plan to Destabilize Iran? Unfortunately, some of the new Administration’s tactics are those of the old. Most likely, it became apparent to US strategists that attacking Iran militarily was impossible for the foreseeable future. It would be an extremely costly operation both in terms of finances and personnel, both of which are in short supply. Therefore, it is not surprising to see “demonstrators” with the latest cellular phones using Twitter and Facebook, and Twitter doing somersaults to accommodate US intelligence services to delay maintenance and then Google doing somersaults to be certain Farsi translation is available as well, as though it’s necessary for the English fluent demonstrators on Twitter and Facebook. It is obvious that all of this sophisticated, expensive communications equipment had to have come from the CIA’s budget of hundreds of millions of dollars allocated for the destabilization plan. It is particularly notable that the so-called opposition isn’t really interested in the validity of the election, they are not interested in getting a recount of votes. They are only interested in making noise and causing destruction and destabilization. Note the signs being carried by demonstrators in perfect English for the benefit of the western corporate media alone, not their countrymen who are the ones they supposedly would be appealing to if they were truly genuine. Police report people have made 10,000 complaints that their daily lives have been disrupted a nd said, "They have called on the police to deal with rallies firmly.” The recent rallies destroyed 700 buildings, burst 300 banks into flame, and damaged 300 cars and 300 public properties. More than 400 policemen have been injured. It’s all a show, a farce, a charade, a Hollywood production meant to further prime the gullible sheeple. After an entire week, there is no evidence of any alleged irregularities. At first, Mussavi claimed victory hours before voting was concluded. Then later it became apparent that his Excellency, Dr. Ahmadinejad, had not lost his predicted 62% of the vote, similar to what he obtained when he was first elected. Ayatollah Khamenei said the exceptional and epic turnout in the June 12 elections was a great show of trust and hope on the part of the nation, a political earthquake for enemies and a historical celebration for friends of Iran and the Revolution. He also said all the 40 million people who turned out for ballot have actually voted for Imam, the Revolution and its martyrs, adding that the four competing presidential candidates belong to the Islamic establishment and therefore they are going to have to pursue their electoral issues within the existing transparent laws and regulations. Ayatollah Khamenei then ruled out any vote rigging in the elections, saying that it is not in the nature of the Islamic System to betray the vote of people and that the electoral procedures of the Islamic System never allow any major fraud. He added, however, that the Constitutional Guardian Council had been instructed to consider any evidence of fraud provided by the complaining candidates and recount those boxes which are deemed necessary in the presence of their delegates. Ayatollah Khamenei also warned that street protests are an appropriate cover for terrorists, and that political weighing in the streets actually challenges the very democracy and elections. He then urged all parties involved to end the wrong political method, adding that if they fail to end the street protests, the responsibility of consequences falls on the organizers and parties involved. “Simultaneously foreign elements triggered a line of destruction, arson, pillage of public wealth and unrest; they have no link to people or supporters of candidates rather they are related to ill wishers of the Iranian nation and mercenaries of western and Zionist spy services,” Ayatollah Khamenei said. Examining the track record of US interference, as the most popular politician in the Iran, Mohammed Mossadegh was elected Prime Minister of Iran in 1951. His major election plank was nationalization of the only oil company operating in the nation at the time, British Petroleum, a measure implemented into law by unanimous passage by the Iranian Parliament. The year 1953 was the year the CIA drove the elected, secular Iranian Prime Minister Mossadegh from office in order to restore to power a brutal monarch and US puppet, Shah Mohammad Reza Pahlavi and to rescue British Petroleum. Due to this US interference in Iranian internal affairs, the US government needs to keep silent and could be why President Obama is reluctant to say anything about it. Consequently, the Shah of Iran ruled with an iron fist: secret police, torture, oppression, terror, corruption, in typical USA style. He was your typical paragon of “freedom and democracy” and western values. He was good buddies with American presidents and Israeli prime ministers, and a main instigator of high oil prices. With all his huge oil revenues, he was good for the US military industrial complex and profiteers in the purchase of weapons and kept them very happy, but he was not good for Iranian or American people. By 1979 the Iranians had had enough. Led by Ayatollah Ruhollah Khomeini, they managed to drive the Shah from power in the Islamic Revolution that has maintained rule in Iran ever since. The US government’s crimes against Iran were not forgotten, and as a result, the US embassy was seized and the personnel held as US spies for 444 days. Any connection to events of 1953 is always obfuscated and dismissed. But 1953 was and still remains fresh in the minds of Iranians. This obviously CIA orchestrated attack on Iran is also an attack on people everywhere who agree with Dr. Ahmadinejad and other world leaders who oppose the empire’s lethal tentacles encroaching into every corner of the globe to seek what it may kill, rob or destroy. What the people of the world need to do is defend Iran’s right to determine Iran’s path, in peace and security with the ballot box. Iranians are a great, cultured, intelligent and fine people. It is not for the CIA or the western corporate media to decide it’s time for regime change. If demonstrators want to scream about fraud and irregularity, then let them start with themselves and full disclosure…let’s see if in some of their bank accounts we might find Bush’s hundreds of millions of dollars. What is the going rate for setting one car on fire? For setting one trash can on fire? For smashing up a car or a building? How many words per minute on Twitter for how many USD? And how does that bring “freedom and democracy”? The international community is getting tired of the color revolution noise and the misery and failure that come with it.